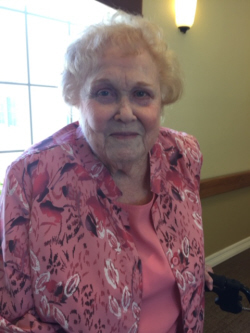 Betty Jo Rogers Wooldridge, 91, passed away, Saturday February 9, 2019. A Graveside service will be Wednesday, February 13, 2019 at 2:00 p.m. at Proffitt Cemetery. Arrangements are under the direction of Morrison Funeral Home. Betty was born May 26, 1927 in Throckmorton to the late Joe and Lela (Timmons) Rogers. She attended college at Hardin Simmons University in Abilene and Midwestern State in Wichita Falls. Betty married G.R. (Bob) Wooldridge, August 9, 1947. He preceded her in death on November 27, 2017. She retired from Texas Department of Health and Human Services in 1989 with 25 years of service. She was always an excellent seamstress and enjoyed reading and making porcelain dolls. Betty won several County Fair blue ribbons with her beautiful dolls. Survivors include; Jane Brooks of Graham, Susan Allen and husband Randy of Taylor, MS. and Russell Wooldridge and wife Gayla of Pittsburg, TX. ; five grandchildren, Lana Pratt of Schertz, TX., Deana Harkness and husband Jarett of Longview, TX., Kristi Wooldridge of Olney, Justin Allen of Taylor, MS., and Jacque Wooldridge of Pittsburg, TX. ; two great grandchildren, Kaleigh Mitchell and Tristin Pratt; two great great grandchildren, Harlee and Brody Mitchell of Schertz, TX. ; also surviving are many nieces and nephews who loved their Aunt Betty.